Researchers and policymakers often refer to ‘foreign firms’, but how do we define a firm as ‘foreign’ and does it matter for our policy conclusions? This column argues due to the dominant practice of using only direct ownership links to identify the owners of a firm, the commonly used definition of a foreign firm captures only half of the foreign firms that exist. Indirect ownership link turns out to be pivotal for identifying firms that appear to be domestic but are in reality foreign, with implications for the measurement of FDI productivity spillovers. Conventions for how we define things are of fundamental importance. Sometimes, however, we forget to question these conventions. The case at hand is the definition of a ‘foreign’ firm. The standard is the IMF definition, where a firm is defined as foreign when a single direct investor, who is resident in another economy, owns 10% or more of the company’s shares (IMF 1993). The conventional use of the IMF definition across many fields has been to look at only direct ownership links, to the neglect of indirect links. Capturing indirect links is, after all, difficult. Nonetheless, this reliance on direct ownership links fails to capture the nature of our globalizing world, where indirect ownership is becoming ever more common. The 2016 World Investment Report (UNCTAD 2016) documents how the ownership structure of some MNEs is characterised by considerable vertical depth – that is, multiple steps from the ultimate owner to the affiliate, across multiple borders. Who is the ultimate owner can be not obvious. In recent work (McGaughey et al. 2018), we show there are many firms that are categorised as domestic under the IMF-based convention but that are, in fact, controlled by foreigners. The implications of such a mis-classification can be very important. In our work, we consider the search for productivity spillovers to domestic firms that arise from foreign presence. We argue that by relying almost exclusively on direct ownership measures of FDI, past empirical studies have stacked the cards against finding positive spillover effects. The IMF’s first Balance of Payments Manual (BPM) was published in 1948 and defined FDI. Subsequent editions reveal an evolution in how the IMF thought one should define foreign direct investment, and thus a foreign firm. Whereas the initial emphasis was on effective control over affiliate decision-making, a shift towards influence was evident from at least BPM3 in 1961. The low 10% minimum threshold of ownership appeared in the BPM5 in 1993. In contrast to the early emphasis on direct ownership links, indirect ownership by a foreign direct investor was also explicitly included in BPM5. However, with the identification of indirect ownership links proving particularly problematic, national statistics do not consistently capture this full IMF definition of FDI. Data constraints and old assumptions have also meant researchers often resort to using only a 10% direct foreign owner definition. Figure 1 below – the ‘egg’ – illustrates our results and highlights just how much the proportion of foreign firms in an economy varies according to how one defines a foreign firm. Note: Own calculations using 2001-2008 firm-level data from ORBIS. This is based on a total of 2,343,495 observations (firms-years), which corresponds to roughly 575,000 firms. The figure does not reflect relative proportions. Source: McGaughey et al. (2018). As shown in Figure 1, the large majority of the observations are purely domestic firms – the set outlined in light blue. While FDI50 observations (the purple set) make up about 3% of the data, MNE50 (the green set) are around 1.0% and the FDI10 observations (the red set) around 1.5%. Thus, the FDI50 definition captures double as many foreign firms as the FDI10 definition. Note that there is an overlap, as firms can both have a single foreign shareholder owing at least 10% of the votes and be controlled ultimately by a single foreign firm. We call the part of the FDI50 that are not FDI10 ‘indirectly controlled foreign firms’ (I-FDI50). These firms are just as many as the FDI10 firms, but are typically categorised as domestic firms under the conventional use of the IMF definition. The potential significance of this mis-classification becomes more apparent when looking at activity summary statistics. Source: Own calculations using 2001-2008 firm-level data from ORBIS. Not surprisingly, pure domestic firms are on average considerably smaller and less (labour) productive than foreign firms. 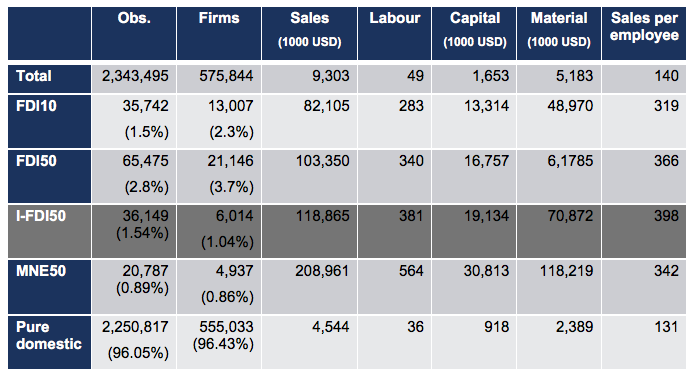 More interestingly, the FDI10 firms are smaller and less productive than the FDI50 firms. The MNE50 (i.e. the European MNEs’ HQ) are by far the biggest firms in terms of activity data, but not in terms of productivity. The most productive firms of all are the indirectly controlled foreign firms (I-FDI50) which, as noted above, are typically treated as domestic firms. There is growing consensus that positive productivity spillovers are found in vertical relationships between foreign affiliates and their domestic suppliers (Javorcik, 2004). In contrast, most studies confirm the absence of positive horizontal (intra-industry) spillovers, or even negative effects (e.g. Aitkin and Harrison 1999, Javorcik and Spartenau 2008, Girma et al. 2015). However, the incorrect categorization of indirectly controlled foreign firms will downward bias the presence of foreign firms and upward bias the productivity of domestic firms. Similarly, including the domestic MNEs in the domestic firm dataset, as is most common, will also upward bias the productivity of the domestic firms. They should therefore be removed from the set of pure domestic firms. To test whether the definition of ‘foreign’ matters, we run FDI spillover regressions for two sets of ‘foreign’ firms (FDI10 and FDI50). The aim is to see how foreign presence within a given industry, year and country affects the productivity of domestic firms in that same industry, year and country. We pay careful attention to ensure it is the change of what is ‘foreign’ that explains our results, and not the particular dataset and empirical methods used. Without controlling for all the possible fixed effects that one can use, we find positive spillover effects from the presence of FDI10 foreign firms. However, consistent with prior studies, these effects disappear when we control for industry, year and country fixed effects. However, using exactly the same methodology, we find positive and statistically significant horizontal spillover effects when using the FDI50 set of foreign firms. These spillover effects do not disappear when all the fixed effects are added. Subsequent robustness checks and analyses reveal that it is indeed the set of I-FDI50 firms that exert the largest positive spillover effect on domestic firms’ TFP. We provide theoretical explanations as to why we should expect this to be the case in our paper (see McGaughey et al. 2018). As the title of this column emphasises, there are many more foreign firms than we think. The use of indirect ownership links – possible with a multi-country database like ORBIS – doubled the number of foreign firms compared to using only direct ownership links. This finding holds consequences for an array of policy that requires the accurate identification of foreign firms including, for example, the identification of cross-border M&As, government subsidies to seemingly domestic but in reality foreign firms, and accurate mapping of global value chains to name a few. We focused on the FDI productivity spillover literature and shown that the correct classification of firms is pivotal for finding positive and statistically significant horizontal spillover effects. Our title could have been “There are more foreign firms than we think, and this is good news for domestic firms”! Aitken, B J and A E Harrison (1999), “Do domestic firms benefit from direct foreign investment? Evidence from Venezuela”, American Economic Review 89: 605-618. Girma, S, Y Gong, H Görg and S Lancheros (2015), “Estimating direct and indirect effects of foreign direct investment on firm productivity in the presence of interactions between firms”, Journal of International Economics 95: 157-169. Javorcik, B S (2004), “Does foreign direct investment increase the productivity of domestic firms? in search of spillovers through backward linkages”, American Economic Review 94: 605-627. Javorcik, B S and M Spatareanu (2008), “To share or not to share: does local participation matter for spillovers from foreign direct investment?”, Journal of Development Economics 85: 194-217. IMF (1993), Balance of Payments Manual, fifth edition (BPM5), Washington, DC. United Nations Conference on Trade and Development (UNCTAD) (2016), World Investment Report 2016, Investor Nationality: Policy Challenges, Geneva. McGaughey S, P Raimondos and L laCour (2018), “What is a foreign firm? Implications for productivity spillovers”, CEPR Discussion Paper 12978.